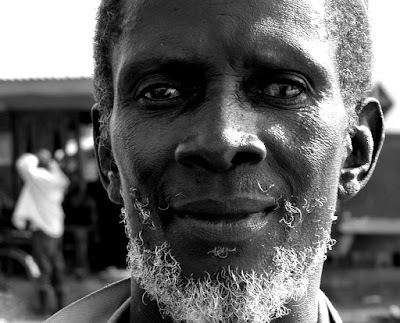 He was told in the capital city of Libreville that nothing could be done for his vision. He has a 2 year-old child that he had never seen with his own eyes. His wife’s friends told her that she should leave him because she shouldn’t be stuck with a man who is already blind at such a young age, when she is so young herself. His wife was ashamed of him. He had affairs and drank too much alcohol; he had lost all hope. So when he had cataract surgery here last week and the patch was removed the following day, he felt like whooping and hollering when he realized he could see again. This week, he decided that he would follow “the God of Bongolo Hospital – the God of Hope.” Pray for a complete transformation of his life.